Freelancers and contract employees can use this sample complaint letter to request timely payment for their services. 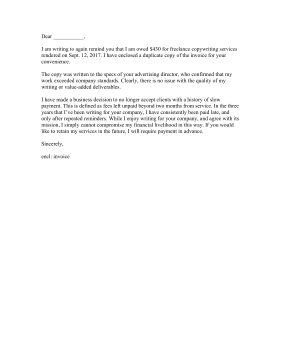 I am writing to again remind you that I am owed $430 for freelance copywriting services rendered on Sept. 12, 2017. I have enclosed a duplicate copy of the invoice for your convenience. The copy was written to the specs of your advertising director, who confirmed that my work exceeded company standards. Clearly, there is no issue with the quality of my writing or value-added deliverables. I have made a business decision to no longer accept clients with a history of slow payment. This is defined as fees left unpaid beyond two months from service. In the three years that I've been writing for your company, I have consistently been paid late, and only after repeated reminders. While I enjoy writing for your company, and agree with its mission, I simply cannot compromise my financial livelihood in this way. If you would like to retain my services in the future, I will require payment in advance.